spinach (palak) etc 1 bunch each. and water till 3 whistle. Keep aside. 2.Take out 4-5 tsp of cooked vegetables and put it in a blender, add fried masala, jaggery ,tamarind and some water and blend it into smooth paste. add 2-3 tsp of cooked vegetables and salt mix well. Cook for 5 mins and switch off the stove. 1.Heat oil in a pan add mustard, cumin , green chillies, curry leaves fry them. and salt cover the lid and cook for few minutes. grated coconut and cook for another few minutes in medium heat. 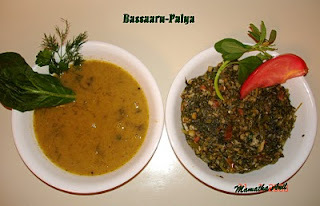 Bassaaru – Palya is ready to serve. Note: This recipe goes well with Ragi Mudde, and rice.